ABOUT THE SOFTWAREThe MP3 software with powerful featuresMAGIX MP3 deluxe MX is the perfect MP3 program for your music collection! Discover an incredible range of function and flexibility that no other music program can offer! Find cool new music and enjoy your complete CD collection and all your MP3s on your PC.Find exactly what you want with the super fast search and filter functions! Arrange yo… ur music according sound and find tracks, artists and albums, create automatic playlists with just one click or fill in missing track info. 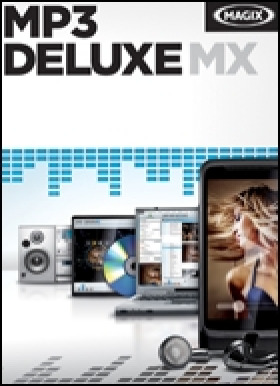 Discover new music any time!MAGIX MP3 deluxe MX offers the best features for new music; sound-based music recommendations, dynamic playlists, the option to transfer music to mobile devices or other MAGIX programs, not to mention the 3D music universe. Discover new music Organize & import everything perfectly Discover new music any time Unlimited compatibilityKEY FEATURES NEW! The handy program guide: provides easy to follow instructions NEW! Additional filter: find music quicker using the vertical search function NEW! mufin Vision: now experience your music with the breathtaking Galaxy view IMPROVED! Find duplicate songs: search find and delete duplicate tracks more effectively IMPROVED! Track info: Edit and create from file names IMPROVED! Optimal performance for 100% fun with your musicSYSTEM REQUIREMENTS Supported operating systems Microsoft® Windows® 7 (32-bit and 64-bit) Microsoft® Windows® Vista® (32-bit and 64-bit) Microsoft® Windows® XP (32-bit)Minimum system requirementsAll MAGIX programs are developed with user-friendliness in mind so that all the basic functions run smoothly and can be fully controlled, even on low-performance computers. Check your operating system’s control panel for technical information about your computer. Processor: 1 GHz or higher RAM: 1 GB Graphics card: Onboard graphics card with a screen resolution of at least 1024 x 768 Sound card: Internal sound card Hard disk memory: 500 MB free disk space for program installation Optical drive: CD/DVD drive (only for installation of the box version)Optional: Burning: CD-R/RW, DVD-R/RW, DVD+R/RW, or DVD-RAM burner USB interface: to connect portable devicesRecommended System RequirementsSome advanced program functions demand more of your computer's processing power. To use these functions fully, your system should at least meet the following recommended requirements. Check your operating system’s control panel for technical information about your computer. Graphic card: DirectX® 9.0c compatible graphics card, 512 MB graphics card space or more and Pixelshader 2.0, ATI X300, NVIDIA® GeForce® 6600 or similar (for mufin Vision 3D music universe) Multi-touch enabled monitor: for using Touch Mode in the mufin Vision 3D music universeNote: The program's internal online services and the online update require an Internet connection.Supported file formatsSupported import formats Audio: MP3, AAC (+), WAV, CD-Audio, WMA (inc DRM), OGG Vorbis, FLACSupported export formats Audio: MP3*, AAC (+) (optional)**, WAV, CD-Audio, WMA, OGG Vorbis, FLACSupported playlist formats Import: M3U, MPL, CUE, Winamp PLS, iTunes (XML/TXT) Export: M3U*Activate MP3 encoder for free**Fee-based activationNote: Artist rights and ancillary publisher copyrights must be respected. Only non-copy-protected CDs can be imported. Restrictions set by the hardware manufacturer may apply when transferring music to your iPod®. A transfer onto iPhone® or iPod touch® may, for example, not be possible.